In her book, Democracy in Chains: The Deep History of the Radical Right’s Stealth Plan for America, Nancy MacLean explains that those who wanted to reap the rewards of unfettered capitalism realized in the mid-twentieth century that democracy and democratic institutions and practices were a threat to their efforts. In the wake of the New Deal and Great Society, Americans had grown to expect the government to provide a safety net for the most vulnerable citizens–the poor and the elderly. The government was regularly called upon to rectify historical wrongs, as in the case of racially segregated schools where schools for Black children were not equal to schools for white children. Labor unions sought collective rights to bargain for better contracts. Environmentalists sought government regulations to protect water and air and other natural resources from contamination and against climate change. Americans saw the government as a source of positive change. In my last post, I lay out MacLean’s case for how libertarians like James M. Buchanan and Charles Koch sought to sow the seeds of nihilism, suggesting that politicians, scientists and educators were not aiming to serve the public good, but for their own interest and therefore should not be trusted. In this post, I address the recognition that these folks came to have that their dreams of capitalism without restraint were at odds with democracy, and the ways that they employed the rhetoric of democracy to undo the democratic gains of the twentieth century, especially in the areas of civil rights, labor unions, health care and social security, and public support for those in poverty. As MacLean explains, average American citizens had come to realize that they could have power to influence government by joining their voices into a collective. Buchanan aimed to break the power of these collectives by casting them as undemocratic special interests. Following his notion of “public choice theory,” where politicians’ goal is only to be re-elected and not to do what is right and just for the common cause, Buchanan argued that politicians had become beholden to “special interests” of labor unions, including teachers unions, and civil rights organizations who would work to defeat them in elections if they did not do what they asked. In this way, Buchanan and his cohort turned the process of making politicians accountable to their constituents into a situation in which politicians were held hostage to those special interests. This rhetorical move is particularly ironic given the Koch brothers active efforts to defeat politicians who supported the Affordable Care Act. MacLean traces this strategy back to Brown V. Board of Education, when Black families sued counties and states that refused to integrate and were then cast as seeking special protections when what they wanted was equal protection under the law and equal access to high quality education. This move culminated in Pres. Reagan casting recipients of assistance for poor families as “welfare recipients” who were taking advantage of the government. By making collective appeals to the government–the only appeals that were effective for those who were historically excluded–by calling these appeals those of special interests, they were able to turn the tables for how to influence government back to those individuals who had the wealth to do so. If collectives were suspect, and only collectives could make a difference for the working class, then making collectives seem undemocratic returned the power to the undemocratic moneyed individuals who could then use the same “public choice theory” that politicians only cared to keep their jobs to threaten politicians that they would lose their jobs if they voted in support of the collective interests of the common people. In Politics III.8, Aristotle says that democracy occurs “when those who control [the constitution] do not have much property, but are poor” (1279b18-19). With this definition of democracy, Aristotle points out the very problem that Buchanan and the Kochs encountered: democracy wants to address the concerns of the poor, who outnumber the rich. Outnumbering the rich, the practioners of democracy are at odds with the rich who aim to produce wealth without restraint or concern for others and without having to support the community in which such wealth is produced. The only recourse for the rich is to make the democratic practices themselves suspect and to replace them with the force of their wealth, which is in fact the current state of affairs. Herein lies the ruse of libertarianism, whose view of freedom is not unlike the view of freedom that Aristotle associates with the democrats: to do whatever they want without license. 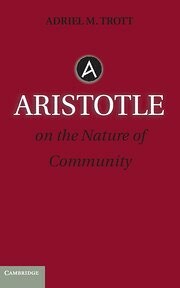 Aristotle implores them to recognize that the law is not slavery, but salvation, as I explicate in a recent article. The law is considered slavery when it is viewed as coming from somewhere else. Law is recognized as coming from somewhere else when government is seen as otherwise than the citizens, which is what Koch et al want — to be the source of government and law at the expense of the democratic many. To the extent that they want to be free of government, they want to be above the collective determination of what is good. Outnumbered, they alone want to say what is good. Their wealth has made them think that they are not dependent on others and so it has made them, like the Cylcops, as one who is “clanless, lawless, and homeless” (Pol. 1253a4). Following the association of wealth with virtue that can be traced back to the ancient oligarchs, who thinking themselves unequal in one way, supposed they were unequal in all ways, they think that their wealth makes them as the one who is so outstanding in virtue that they should not be a part of the city (1284a4-7). As MacLean shows, they aren’t really opposed to the city and the law altogether, but they want it to divide the city in such a way that the government serves only their interests rather than that of the democratic majority. Arguing that the collectives are undemocratic, they aim to make the government undemocratic for their own ends. They are willing to put their wealth to work to turn the law and government from the public good to their own private goods. They do this because they suppose they are better than the democratic majority, but it is worth noting that Aristotle will go on to say that the multitude is stronger, richer and better, when taken as a collective (1283a39-41). The libertarian critique of government works as a ruse: it criticizes democratic efforts as undemocratic in order to undo democracy. It works to encourage the majority to think it is undemocratic for the government to restrict those trying to make the community undemocratic. This stealth move puts democracy in chains. The last weekend in October of last year, I was at the former Labyrinth Bookstore in New York City where I picked up Jacques Rancière’s The Hatred of Democracy. Ten days later, the country would elect Donald Trump to the presidency. Since then (and well before), the cries against democracy have come in from many corners. Jason Brennan, philosopher at Georgetown, wrote a book Against Democracy in which he calls for an epistocracy. Andrew Sullivan argues that democracies end when they are too democratic in New York Magazine. Caleb Crain discusses the case against it in The New Yorker in the issue published the week before the election. Crain quotes the famous Winston Churchill line, democracy is the worst form of government except for all the others that have been tried from time to time. That line put me in mind of what Chesterton said about Christianity, that it hasn’t been tried and found wanting, it has been found difficult and not tried. Or perhaps not difficult, but scandalous. This I believe is what Rancière is arguing about democracy. Donald Trump has for several weeks now been calling into question the results of an election he has yet to lose. He has suggested that he will put his opponent in prison if he is elected. Earlier in this campaign he said he would instruct the US military to go after the families of suspected terrorists and he encouraged his own supporters to attack protesters with promises of paying their legal fees. He has publicly shamed members of the media whose coverage of his campaign he does not like, as in this most recent case with Katy Tur. He has generally violated the unwritten norms of American public discourse and political office-seeking. His supporters describe his approach as refreshing. I think what Trump has showcased for better or worse is how fragile the democratic project is. This year in buying our house I learned a little something about how the rule of law operates on a fiction. The fiction is that there is something that binds us to the rule of law. Generally, we act as if the law binds us, but on occasion, when people decide it does not bind them, the fictive nature of the rule of law becomes clear. That’s when you have to decide if you want to do anything to actually force the law to work, because it won’t on its own. Making the law have teeth then requires an additional expenditure of time, energy and money. Just ask any of Trump’s vendors that he never paid. Since Rousseau expressed his concern that government, established to carry out the general will of the people, might become a separate body with its own distinct general will, members of the polity have worried from one end of the political spectrum to the other, that government is imposing its will on the people, rather than executing the people’s will. It’s not even correct to date this concern to Rousseau, since we could argue that such a concern is encapsulated in Thrasymachus’ realpolitik definition of justice — we all know, let’s be honest Socrates, that the laws serve the powerful and not those who are supposed to follow them. In these cases, government is understood to be against us, treading on us with its laws and impositions, limiting our freedom rather than protecting it.